At a health insurance marketplace presentation Tuesday afternoon at Waterville Public Library, a health marketplace navigator explained how uninsured people can find and sign up for affordable health care. 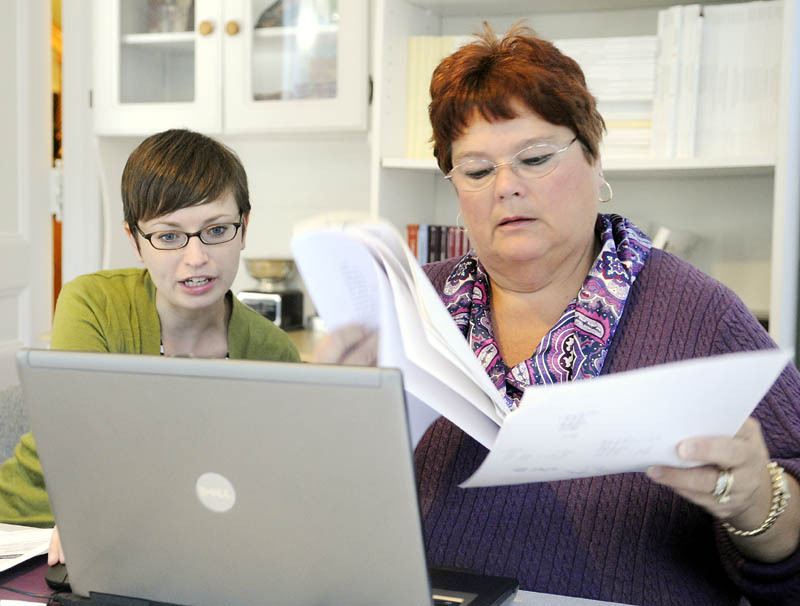 WATERVILLE — If anybody is in a health insurance bind, Mark and Brenda Lint are. They’re an example of what happens when you become injured, lose your job and health insurance and try to muddle your way through to get help. “We’re in a mess,” Brenda Lint, 57, of Winslow, said Tuesday. The Lints attended a health insurance marketplace presentation Tuesday afternoon at Waterville Public Library, where Jake Grindle, a health marketplace navigator from the Western Maine Community Action Program, explained how uninsured people can find and sign up for affordable health care. 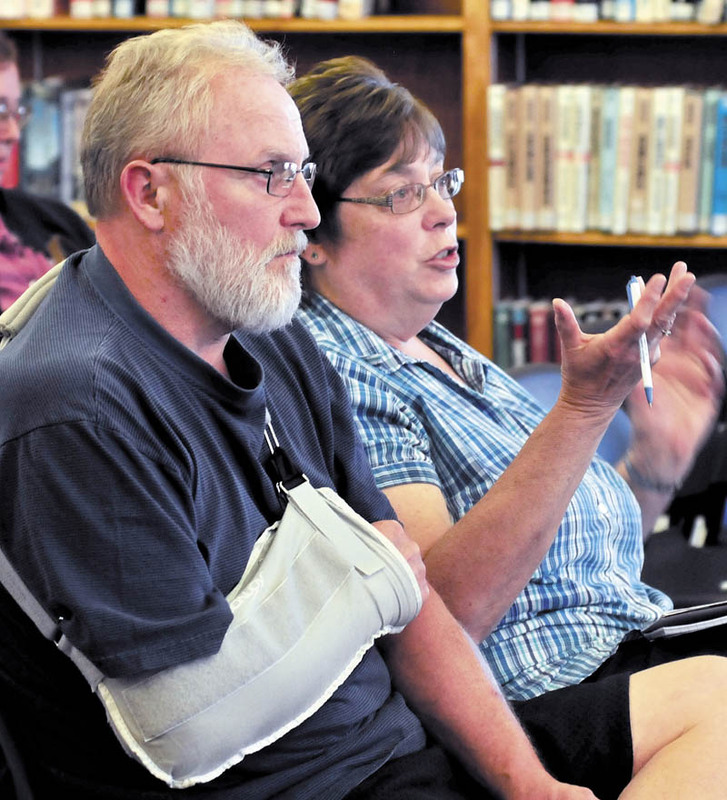 Mark Lint, 58, his right arm in a sling, sat with his wife and about a dozen other people who sought answers to questions about the Affordable Care Act. Lint said he was told by his employer of 27 years that as of midnight Monday, he was terminated from his job as a gas delivery man. In early August, he had surgery on his shoulder for a torn rotator cuff, which he said was a work injury; but his company denied the claim. The company also said he doesn’t quality for short-term disability because he is claiming a work injury. The workers’ compensation board is reviewing the case but says it may be a year until he gets a decision, he said. Meanwhile, when he lost his job Monday, he also lost the insurance he had through work. She said she thought it might be less expensive to seek health insurance through the marketplace than by paying for COBRA, a transitional insurance coverage Mark Lint expects to get soon. Brenda Lint is disabled. She has had cancer, a knee replacement and a herniated disk in her back — and gets Medicare Part A, she said. She learned Tuesday that she will not be able to get any further assistance through the marketplace because the Affordable Care Act does not allow someone receiving Medicare to do that. Instead, she must seek assistance through Medicare. Grindle said one of the most common calls he gets is from people who are on Medicare, asking whether they can sign up for insurance on the marketplace. Brenda Lint said her husband will have to stay on COBRA until he can apply for insurance in the marketplace Jan. 1. The couple’s 24-year-old son, who was on Mark’s insurance through work, has Crohn’s disease, and treatment for that costs $24,000 every eight weeks, they said. “We really have to make sure that we have insurance,” Brenda Lint said. After listening to Grindle’s presentation, she said a lot of her questions were answered. Throughout Maine and the country Tuesday, thousands of people sought information about how the new federal health care program will work. Emily Brostek, consumer assistance program manager at Consumers for Affordable Health Care in Augusta, said the foundation’s help line received at least 55 calls Tuesday, and two people visited the office in person to seek information. For comparison, the help line averaged about 15 calls per day in August. 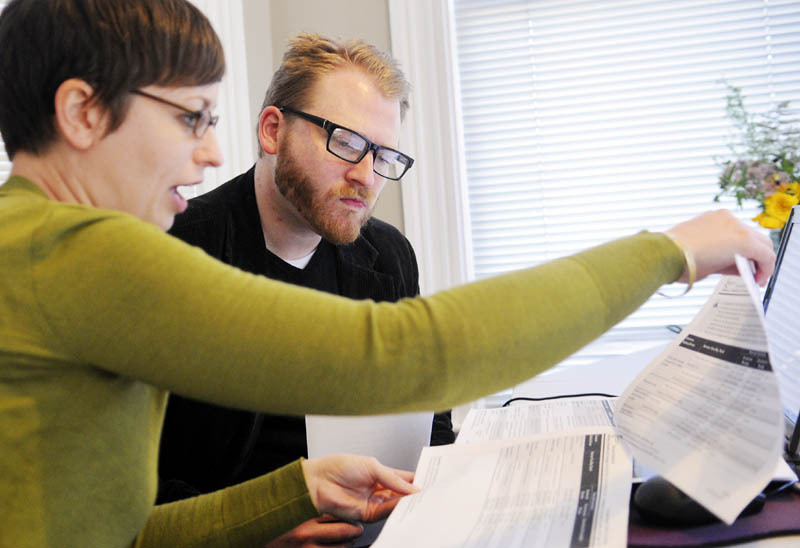 Joseph Ditre, the executive director of the Augusta-based organization, said people might have been frustrated by the delays they encountered on the phone or online, but he wants them to know that open enrollment will continue through March 31. “That incredibly high call volume and online traffic really indicate a level of interest that shows that the program was needed,” Ditre said. Brostek said the callers were a mix of people who don’t have insurance and those who have individual insurance plans but want to see what the options are. Some were well-informed, but at least one person had never had health insurance and needed premiums and co-payments explained to her. Consumers for Affordable Health Care staff helped find answers to questions such as whether health care providers in Florida would accept one of the Maine plans, whether certain medications would be covered, whether callers’ incomes would qualify them for tax credits, which of Maine’s two plans would be best for the caller and how to help adult children purchase a plan through the marketplace. 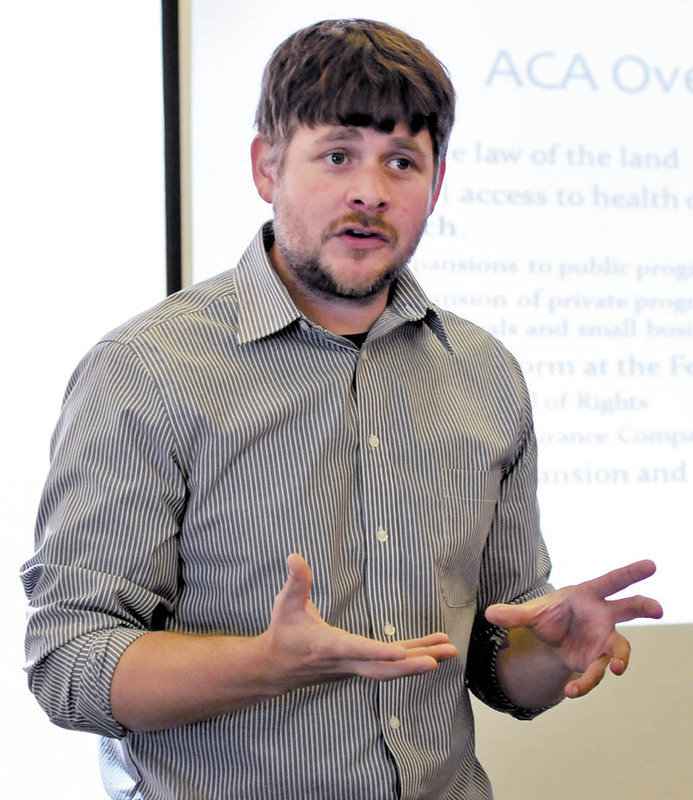 In Waterville, Grindle showed a slide presentation explaining how one can explore insurance options online and apply for insurance, which is required through the health care act. Cheryl Leonard, a navigator for the Kennebec Valley Community Action Program, was on hand and gave another presentation at the library later Tuesday. Both she and Grindle said people can get health insurance — and help finding insurance that best suits their needs — by going online to healthcare.gov or enroll207.com or by contacting community action programs or federally qualified health centers such as HealthReach. She and Grindle are ready to help people. Grindle may be reached at [email protected] or 860-4457. Leonard, who covers Kennebec and Somerset counties, may be reached at 859-1567, and callers may make an appointment. Kennebec Journal Staff Writer Susan McMillan contributed to this report.